The Foster Keencut Steeltrak cutting system is designed with the sign making and the graphics industry in mind. The Steeltrak includes four cutting tools for a variety of substrates. These cutting tools are permanently attached to the cutting head, all the user has to do is just turn the wheel and each tool is ready to use in a seconds and every tool cuts on the same line. No special operator knowledge is required; this machine is easy to use and produces accurately desired results every time. The Utility Blade is used for ½” thick foam centered materials, the scoring blade is used for acrylic, and the glass scoring wheel and twin wheel cutting head are used for MDF boards, masonite, dibond, and alumalite. The SteelTrak has a rigid hollow-chamber horizontal squaring arm that supports the heaviest boards so materials won’t bend or distort and you will get square straight cuts every time. Materials load easily from right or left side and lock securely into place and the two flip stops make cutting to size easy. The flip stops can be engaged or disengaged without disturbing the settings. All adjustments are on the front of the Steel Trak and easily accessible for cleaning, checking and maintenance, whether it is free-standing or wall-mounted. Super grade anodizing is great for a lifetime of good looks and functionality. The SteelTrak is available to cut lengths, 65″ and 82″, making it the longest and most accurate manual vertical cutter available. The extruded back beams with dihedral angle offers firm support for sheets both large and small. The full-length silicone grip and perpendicular pressure sensitive clamp keeps materials steady and can be easily aligned. Accurate cutting by eye is made simple by the dual calibrated scales and the ball bearing sliding guidance system on the steel tracks. The extra heavy-duty aerospace alloy running beam and squaring arm accessible from any position are essential for easily cutting heavy materials. 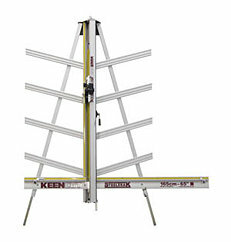 If you have any questions or are interested in purchasing the Foster Keencut SteelTrak, visit us at SpiralBinding.com. We have great pricing on a full line of Board Trimmers. Call us at 1-800-631-3572 for more information!